Chaos nightclub at City of Dreams Manila presents international DJ/Producer Ookay (pronounced “Okay”) on December 8 to set the party scene in full throttle. Paving the way for the trademark bass-laden Trap and Dubstep tunes of Ookay are Chaos resident DJs MVRXX and Jet Boado together with hype man MC Ronthug who will kick start the party with riveting energy. Ookay is the stage name of San Diego-based Abraham “Abe” Laguna, who is best known for his heart-pounding and heavy-handed tracks synthesized with dub and trap beats. His signature style is evident in his latest smash hit "Bouncer" with EDM duo Showtek, which topped the Beatport EDM music chart following its release. In 2016, Ookay’s self-released original titled "Thief," was listed in Spotify and quickly went viral in the US and global charts with over 3 million online streaming listeners. The Sirius Electric Area program by Sirius XM Radio Station which is broadcasted across the US and Canada named “Thief” as the most played song on its first month of release. Ookay's undeniable creativity and talent has garnered support from the likes of Skrillex, Diplo, Major Lazer, DJ Snake, Steve Aoki, DJ Mustard. Cruising from city to city performing for various music festivals in the United States, Europe and Asia, Ookay’s releases including remixes of Congrorock’s “Bless Di Nation Ft. Sean Paul” and Steve Aoiki, and Chris Lake & Tujamo’s “Boneless.” He seamlessly combines EDM and Hiphop influences, while creating a musical style all his own. His collaboration with EDM superstar Diplo to remix Avicii’s “You Make Me” is also considered as one of his best works. Armed with numerous ear-catching releases and a rapidly growing number of fans around the world, Ookay shows no signs of stopping, creating even more captivating hits including “Chasing Colors” featuring Miley Cyrus’ youngest sister Noah, “Back Again”, and “Lighthouse”. The event is co-presented by Heineken and supported by Red Bull. 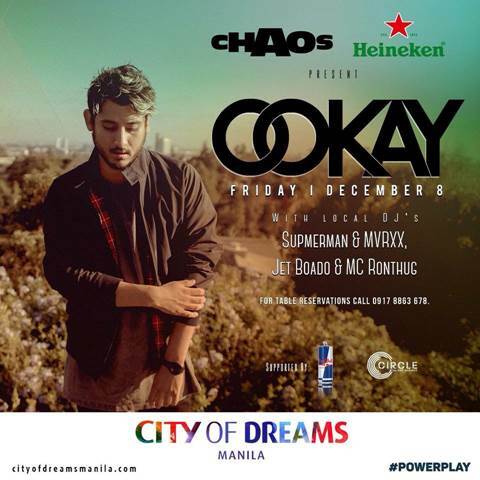 For Chaos VIP table reservations, guests can contact 0917-8863678. Door charge is priced at P 1,000 inclusive of one drink.